Crininae is one of four subtribes within the tribe Amaryllideae (subfamily Amaryllidoideae, family Amaryllidaceae), with a pantropical distribution (Crinum) and also sub-Saharan Africa. Leaves frequently show an intercalary meristem and are usually fringed with cartilaginous teeth. The leaf apices are also often truncate (cut off). The flowers may be actinomorphic to zygomorphic, with a perigone tube with free stamens. The fruit is indehiscent, irregular, and often rostellate (rosetted). The scape does not abscise (shed) during seed dispersal, with the exception of Cybistetes where it detaches at ground level. The seeds also lack an integument, but are endosperm-rich and partially chlorophyllous with cork-covering. Widespread in the tropics (pantropical) and sub-Saharan Africa. ^ Meerow & Snijman 2001. ^ Milne-Redhead & Schweickerdt 1939. ^ Kwembeya et al 2007. ^ Snijman & Kolberg 2011. Milne-Redhead, E.; Schweickerdt, H. G. (October 1939). "A new conception of the genus Ammocharis Herb". Journal of the Linnean Society of London, Botany. 52 (342): 159–197. doi:10.1111/j.1095-8339.1939.tb01601.x. Meerow, Alan W.; Lehmiller, David J.; Clayton, Jason R. (March 2003). 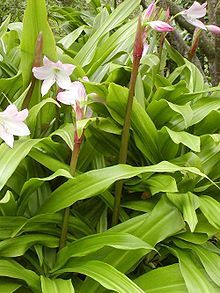 "Phylogeny and biogeography of Crinum L. (Amaryllidaceae) inferred from nuclear and limited plastid non-coding DNA sequences". Botanical Journal of the Linnean Society. 141 (3): 349–363. doi:10.1046/j.1095-8339.2003.00142.x. Kwembeya, Ezekeil G.; Bjorå, Charlotte S.; Stedje, Brita; Nordal, Inger (1 August 2007). "Phylogenetic Relationships in the Genus Crinum (Amaryllidaceae) with Emphasis on Tropical African Species: Evidence from trnL-F and Nuclear ITS DNA Sequence Data". Taxon. 56 (3): 801. doi:10.2307/25065863. Meerow, Alan W.; Snijman, Deirdre A. (December 2001). "Phylogeny of Amaryllidaceae Tribe Amaryllideae Based on nrDNA ITS Sequences and Morphology". American Journal of Botany. 88 (12): 2321–2330. doi:10.2307/3558392. Snijman, D. A.; Linder, H. P. (1996). "Phylogenetic Relationships, Seed Characters, and Dispersal System Evolution in Amaryllideae (Amaryllidaceae)". Annals of the Missouri Botanical Garden. 83 (3): 362–386. doi:10.2307/2399866. Vigneron, Pascal (2008). "Amaryllidaceae". Amaryllidaceae.org (in French). Retrieved 23 October 2014. Snijman, D. A.; Kolberg, H. (2011). "Ammocharis deserticola (Amaryllideae), a new species from Namibia and a key to species of the genus" (PDF). Bothalia. 41 (2): 308–311. Wikimedia Commons has media related to Crininae. This page was last edited on 13 January 2019, at 20:22 (UTC).